Reginald, mark you, whose normal batting style was a sort of cross between hop-scotch, diabolo, and a man with gout in one leg trying to dance the Salomé Dance. Unlike Reginald, who we shall return to anon, my story is a painful one. As a young girl in 1970s Australia, finding an opportunity to play cricket was challenge enough. I joined the school team of course, but was never allowed to bat or bowl in the nets at practice. My duties were restricted to fetching wayward balls. My name was usually omitted when the weekly team notice was posted, although occasionally I was named 12th and my parents would drop me at some far-flung suburban ground to spend a day watching others play. Batting last, I made four not out in the last two desperate overs of our innings, but my poor showing in the field reinforced the coach’s prejudices and I was never picked again. As a young woman, no longer dependent on the benevolence of adults, I worked hard to learn the game with the assistance of talented cricketing friends. When no friend was to hand, I spent hours alone in the local nets, bowling at an empty wicket. I played indoor cricket several times a week, wrote match reports for a newsletter, and enjoyed every opportunity for a social game. As a bowler, I developed a knack for ousting over-confident batsmen. Their faces would light up like a child’s at Christmas when I came on to bowl, for in addition to being a girl, I was also short, pudgy and wobble-breasted. The decent players would pretend not to have noticed, but more ordinary batsmen looked on me as their big chance – like Wodehouse’s Reginald when he discovers Blagdon is bowling. The sight sent a thrill through Reginald. He had seen Blagdon bowl at the nets, but he had never dared to hope that he might bat against him in a match. Exigencies of space forbid a detailed description of Blagdon’s bowling. Suffice to say that it was a shade inferior as bowling to Reginald’s batting as batting. Scarcely had Reginald recovered from the pleasurable shock of finding Blagdon bowling at one end when he was amazed to find that Westaway was bowling at the other. Critics had often wrangled warmly as to the comparative merits of Blagdon and Westaway as bowlers; some thought that Blagdon had it, others that Westaway was the more putrid of the two; a third party called it a dead heat. The prospect of my bowling evoked similar joy in opposing batsmen. Even before my first ball, hitherto unpromising players would be seen scoping-out gaps in the field and practicing hook shots in the air. By the time I waddled up to release my ball (which I insisted was medium pace, however slow the act of delivery appeared) the batsman would have invariably run out of patience and danced up the pitch to meet the anticipated long-hop or full toss he had mentally prepared to score off. I was wise to this and never pitched short. The over-confident amateur would find himself stranded a long way from home with no time to make alternative plans for unexpected deliveries. Every wicket claimed felt like a great triumph. In describing Reginald Humby’s emotions on the occasion of his unexpected century, Wodehouse shows us the depth of human feeling he was capable of bunging into his art. The ordinary batsman, whose average always pans out at the end of the season between the twenties and the thirties, does not understand the whirl of mixed sensations which the really incompetent cricketer experiences on the rare occasions when he does notch a few. As ball follows ball, and he does not get out, a wild exhilaration surges through him, followed by a sort of awe as if he were doing something wrong, even irreligious. Then all these yeasty emotions subside, and are blended into one glorious sensation of grandeur and majesty, as of a giant among pygmies. Buoyed by minor successes with the ball, I decided to join a cricket club, where I was permitted to carry the drinks and keep score for F Grade (or perhaps it was Q grade). It was a starting point, and the players welcomed me, a 19 year old girl with limited cricketing experience, more warmly than I expected. A little too warmly in fact. It became quickly and painfully clear that they did not take my interest in playing cricket seriously — I was considered something of a groupie, ‘hanging around’ the team presumably in order to bed them. The team in question were arguably the most unattractive assortment of male specimens ever gathered together on a field; lecherous gout-ridden has-beens, beer swilling could-have-beens, and arrogant thought-they-weres. The only player whose personality would not make his own grandmother wince was the wicket-keeper, who was permanently stoned. Their collective lack of hygiene and inability to keep whites white (members opting instead for a shade of fungal yellow to match their teeth) would have repelled even the staunchest admirer. The idea that I would set my heart on bedding a team of cricketers is insulting; that I would then proceed to select this bunch of degenerates, is astonishing. And yet, this deluded idea they undoubtedly had. The last time I played in a village cricket team match I was caught at point by a man in braces. It would have been madness to risk another such shock to my system. My nerves are so exquisitely balanced that a thing of that sort takes years off my life. If our team had contained a man in braces, it would have raised the tone considerably and helped draw the eye away from the fungal yellows. 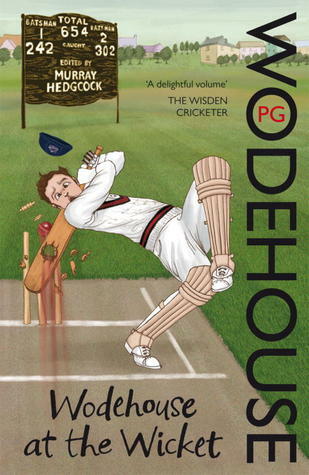 It has now been over twenty years since I played the game and reading Wodehouse on cricket is the closest I get to capturing the enthusiasm I once held for it. Every so often I grow wistful and think about returning to the game, but if the chaps couldn’t accommodate me in my prime, they’re unlikely to indulge me in flabby middle-age. Women do play cricket these days – and good luck to them – but women’s cricket is highly competitive, for skilled and serious athletes. There is no tradition of laid-back social cricket, where women of advanced years and limited ability can combine their love for the game with a long lunch break and a few pints — like Reginald Humby’s club, The Hearty Lunchers. They belong to the school of thought which holds that the beauty of cricket is that, above all other games, it offers such magnificent opportunities for a long drink and a smoke in the shade. The Hearty Lunchers do not take their cricket in that spirit of deadly and business-like earnest which so many people consider is spoiling the game. 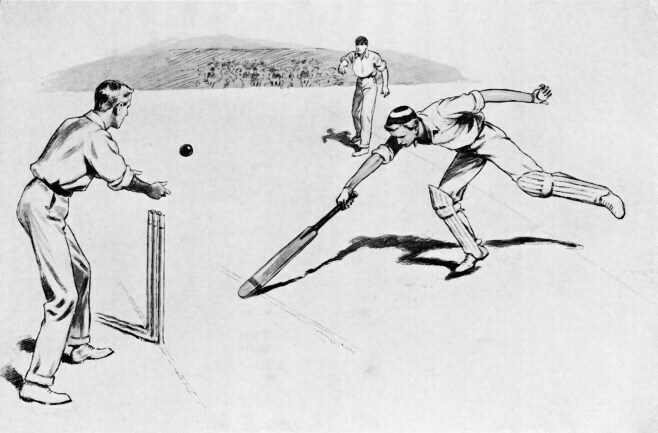 A Hearty Luncher who has been given out caught at the wicket does not explain on arriving at the pavilion that he was nowhere near the ball, and that the umpire has had a personal grudge against him since boyhood. No, he sinks into a deck chair, removes his pads, and remarks that if anyone was thinking of buying him a stone ginger with the merest dash of gin in it, now is his time. The Hearty Lunchers don’t mind that Reginald can’t bat, they make room for him anyway, giving ‘Reginald’s Record Knock’ a special place in my heart. In a wonderful twist, Reginald’s betrothed Margaret Melville is also revealed as a cricket lover who plays in ladies matches. 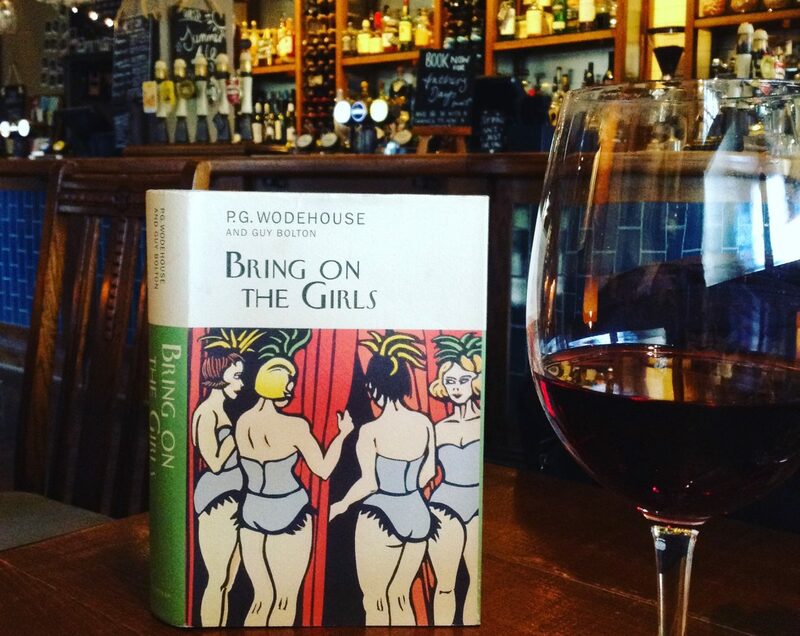 Wodehouse depicts her enthusiasm for the game as genuine, perfectly natural – even admirable. Nothing sordid or unseemly is suggested when we learn Margaret regularly attends the Chigley Heath matches, with a crowd ‘…mainly composed of small boys and octogenarians…’ The fact that Margaret plays in ladies matches also suggests the presence of other lady cricketers — some 17 years before England had a Women’s Cricket Association. Once again it’s worth observing that Wodehouse’s ‘treatment’ of women betters not only his contemporaries, but often our own. The world of cricket may have lost me, but perhaps it’s not too late to try my hand at golf. You have surely hit a sixer with this post! Thanks Ash. It was actually an emotional sort of experience writing this one. I think my love for Plum took over when my love for cricket died. See what the Plumtopians have gained! Isn’t there a gag about someone’s meat being another one’s poison? Too true. My other great tragedy is that I’ve never managed to convince my closest friend, or my family, to like Wodehouse. I too mourn the death of your love for cricket. This is an absolutely wonderful post! But how sad that your genuine passion and enthusiasm should have met with such a desultory response from almost all concerned! I wanted to have a go at playing cricket during my Masters a couple of years ago, so I joined a uni team which said it was for players of all abilities. Of course I got to the first practice and discovered that I was the only girl and that everyone else was definitely not a beginner! I only played in two matches – the first one I also foozled a catch and the second one, in which I actually batted, I was out on the first ball! Not a great success – and for both games I was the only girl playing, on either team. After that, my enthusiasm somewhat waned and I also had a dissertation to write, so I didn’t go to any more practices. The team were actually quite friendly and happy to give me tips, it was just that I was so far behind them in terms of ability that it felt like I was more of a burden than an asset – though of course they never said that. Like you, I wish there were teams for amateurs who just want to play for fun, but I guess the people who have the motivation to start a team are usually those who are also very keen to win. I very much enjoyed going to the PGW Society cricket match at Dulwich College though – it really is very laid-back and friendly and I didn’t feel at all excluded by my total lack of cricketing knowledge! A joy as always. The detailed description of your erstwhile team was a great piece of fiction(?). And the unremembered quote about the comparative demerits of the cricket players recalled Plum’s wonderful formulaic writing as in “A Woman is Only a Woman” when he compares Peter Willard and James Todd as golfers. Thanks for the humor and Wodehouse insights. Thanks for taking the time to comment, Ken. The truth is often stranger – and funnier – than fiction. I had great fun writing that particular part so I am glad you enjoyed it. I need to revisit ‘A Woman is Only a Woman’ because it’s been a while since I read it. Thanks so much for sharing your cricket story. I agree, it’s hard to catch up when the other players are more skilled and experienced, but I’m glad you had the opportunity to try – and were kindly received. I think the lack of social, amateur sport for people of limited ability/ experience is a more general issue. I am sure many more people would participate in organised sport if teams weren’t so daunting and competitive. I especially feel this now that I’m older and out-of-condition. You’d hope there’s no way what you experienced would happen these days, at least at junior level, though I feel you may still be right about adult competition. What ho there, Duffer. Those are heartening words indeed. I am very pleased for young cricketers to hear them. I believe it is also good for development of the talented players (bowlers especially) not to be overplayed. What Ho, Jon! Thanks for the very kind words. It’s nice to ‘meet’ someone who shares similar ideas. I’ve never actually seen a Rugby game from beginning to end, and I don’t know one code from the other. I recently moved from Australia to England so I should correct this and go to a local game. There is a ground not far from my house where local matches are played. I might never be able to write something sensible on the subject, but I may be able to offer some amusing observations as a beginner. I’m sure you could! Bertie was also a naive observer of a game, IIRC. The Master used to visit Dulwich college regularly in later life to watch the rugby games. Raymond Chandler was also an old boy, and I have a relevant piece about that to put up on the blog 🙂 Besides cricket, golf and rugby PGW also used football (soccer) to comic effect in Psmith in the City, where Psmith becomes (for nefarious purposes) an expert on the fortunes of Manchester United. Marvellous bit of writing there! For some reason I’m reminded of the tidbit of information I picked up on during a tour of Lord’s Cricket Ground, involving WG Grace having just batted during a test match and getting out and then informed the team captain that he was required to catch a taxi to South London as he was scheduled to run a race at an athletics carnival, and the captain acquiesced provided he made it back in time to field in the next inning. What Ho, Jason! It heartens me to hear there was once an age when chaps of WG Grace’s proportions could indulge in cricket and running races. These days he would be omitted from the side until he could conform to svelter expectations. Very well written, I’m sorry your experiences with the game of cricket were not what they should have been. I seem to remember that Wodehouse’s love of the game also declined in his later years and that he became an enthusiast of baseball of all things. My trouble was that I was a rather decent fast medium bowler, but a terrible batsmen and fielder. I’d bat at number 11 and field at fine leg/third man or somewhere else innocuous, but open the bowling. I was always put in teams which suited my bowling abilities, but which made my lack of ability in the other departments look rather noticeable. I haven’t played for a while now because of the anxiety and trepidation I experienced every week leading up to matches. I still love the game in general though, and glad we walloped you in the Ashes ;). What Ho, Saxo! Thanks for the sympathetic comments. I too can recall the anxieties of batting at the end of the order. Although occasionally, if the going was good, I could also become one of those over-confident tail-enders who might lash out at a loose ball with foolish enthusiasm. I’m glad you still enjoy the game — and the Ashes. I lost interest entirely during the Warne years and have never returned to watching the game at international level, although I still enjoy local cricket when I come across a game in action. Sadly, I don’t think there is nearly enough cricket being played here in the UK. I have made several enquiries about getting access to practice facilities so I can teach my daughter the rudiments of the game, but it’s near impossible unless you have a decent wad of cash to hire professional facilities. In Australia, most school grounds have a few nets available to the general public to use — free of charge — at weekends. It’s a shame so many youngsters in Britain don’t an opportunity to play the game. What a lovely surprise for me today, (it’s been a bit of a tough week), so thank you for your reply. Yes unfortunately in the UK cricket has become a restricted game for a great deal of youngsters. This tendency has only been sharpened with cricket being absent from schools and terrestrial television. Of course this was not the way in Yorkshire (where I grew up) and where there is a great culture of local clubs. Youngsters can turn up from any background and learn the game. And a good club will play junior teams with both girls and boys, if their sensible, realising that often the girls are more skilful than their male peers, even if they don’t match them for brute strength alone. And again the best clubs try to play the full squad, not just choosing a few select players. Of course, as with all sport teams, cliques can form in clubs and individuals end up left out in the cold. I’ve never found this to be the case with cricket, but this happened to me with rugby. I am so sorry to hear you’re having a difficult week. I wish there was something I could do to brighten it for you. You have described my cricketing ideal, and I’m not at all surprised to hear that it once existed in Yorkshire. If I can encourage my daughter to play, I’d be keen to get more involved in local cricket in my area, to help bring the vision you describe to fruition for the younger generation. Week turned out fine in the end, the problem I was having was resolved rather quickly. Yes, a good cricket club usually appreciates help from the local community, especially from good eggs like yourself. Cheers, old sport. (Now it is my turn to have a dastardly week –fingers crossed it improves). I do hope it improves, my friend, modern life, eh? I’m not sure I altogether approve of it! Not the stressful parts anyway. I could not agree more. I shall be delving into a bit of Wodehouse for respite this week.